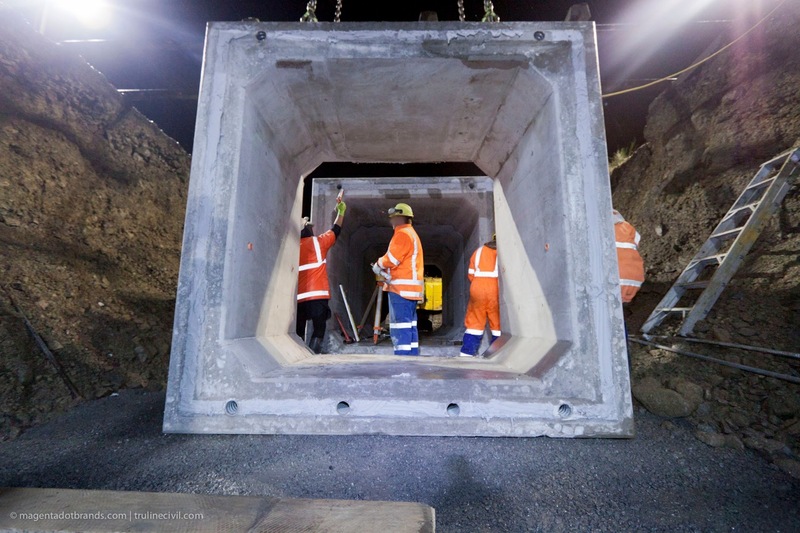 The 1.5m box culvert sections were crane lifted in and laid on the compacted granular backfill to the precise, g.p.s. specified line and laser-proven grade and depth. The bedding design for the box culvert was designed by the Opus Engineer who is knowledgeable about the Arthur’s Pass ground conditions which thereby ensured a successful installation. The proper installation of precast concrete box culvert starts at the downstream end and works back up stream with the culvert spigot end facing downstream and the bell end facing the upstream side. The installation practices were consistent with the engineer’s design assumptions. The best method of sealing the compression joint between the two mating concrete sections was the hydraulic application of a force of 80 tonne longitudinally to the 10.5m culvert in order to optimally compress the sealant material. The sealant used was designed to resist hydrostatic forces at the box section joints to provide a watertight seal. The sealant provides a reasonable level of assurance for performance in a hydrostatic conditions. As the final culvert section is lowered into place sealant material is being caulked around the top of the compression joint between the two mating concrete sections. Shape: Sealants work best at higher rates of compression. As the sealant is compressed, the resistance force for further compression increases as a function of the percentage of compression. Size: The size of sealant applied was determined by the volume needed to fill enough of the void to prevent a hydrostatic force being capable of pushing the sealant. Placement: Best practice was followed, the sealant was placed in the annular space. The sealant material was caulked around the bottom and sides of each interior joint. Adhesion: The sealant adhered well to the clean, dense, well cured concrete surface. The continuous insertion of the 6 x 10.5m long high-tension steel rebars longitudinally into the culvert is a team effort.